I’m back! My “loop” was successful, and I’m now back at home recovering, sans thyroid. At the moment (due to the wound, bandage & internal bits & bobs), it feels like something’s strangling me constantly, but I try to ignore it…! The hospital stay was mercifully short with a nice roommate and great care by the hospital personnel. Now, I’m living on soup, testing the waters with vocal exercises, and resting my throat when it needs it – but need to challenge it as soon as the swelling goes down so that I don’t lose my vocal range. When I let my friends and family on Facebook know what’s been happening, someone made a comment about the scar (hoping that it wouldn’t be visible long, for my sake); but I must confess that that aspect of the whole procedure was and is my least concern. For me, scars mean that I’m alive; they mean that my body is healing itself. They are a part of my history and have been instrumental in making me who I am. In the western world, there is a shameful abundance of waste; if something gets broken, most people just throw it away. But what if we were to adopt the Japanese mentality? Chances are, we’d begin to look at the world around us through different lenses. We would then begin to see the people around us from a different perspective. Our modern media culture has become fixated on perfection (what they deem perfect changes over time; at the moment that standard tends toward the inane, the plastic, the uniform, and the anorexic, to put it bluntly); but this perspective can often blind people to the beauty of the unique and the diverse. The English term Plumbago came into the language via Latin for a type of black lead ore. In the 1500s, a large deposit of this ore was found in Cumbria, England; this particular vein was so compact and pure that it could be sawn into sticks, and it holds the record to this day of being the only large-scale solid ore deposit. It wasn’t long before its value was recognised, and subsequently monopolised by the English Crown. Long live the king and all that. When the Crown had enough to last them awhile, they would flood the mines to prevent theft. How clever is that? Right. The English folk have long been resourceful blokes, and they smuggled “lead” (carbon) out for pencil production and a bit of dosh on the side. I wonder how they drained the flooded mine shafts? It was used as a strategic secret by the British to make smoother cannon balls: They would take the native ore, in its powdery form, and smooth it along the insides of their cannon ball moulds, allowing them to slip the molten hot ball out of the form intact. It gave them a great advantage over conventional (enemy) artillery as it was more aerodynamic, and could inflict more damage more accurately. During the Battle of Trafalgar, so many French bodies were stacked on their decks that, when seen by the British officers boarding the conquered ships, it shocked even war-hardened military men. But I digress. In 1789 a German mineralogist, Abraham Gottlob Werner, coined the term Graphit, from the Greek word graphein, meaning “write”, because it was at length used in pencils. 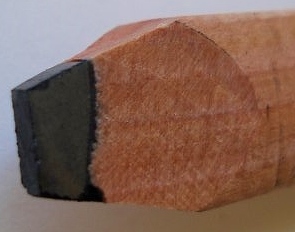 The first sticks of lead were wrapped in strips of leather to support the soft lead. England held the monopoly on that until a way was found by the Germans (as early as the mid-1660s) to reconstitute powdered lead. The German word made it into English around 1796. So there you have it: Plumbago wins by a long shot over (the bow of) Graphite. If you’re interested in seeing how pencils are made, click here for a 10-minute YouTube video. This week’s lineup of oddball jobs includes a literal odd-ball job: Diving for lost golf balls. That might seem like a perfect job for someone who loves the outdoors and diving – that is, until you face alligators in Florida (and yes, the video footage is real). I think it would be a cushier job (pun intended) to be a furniture tester. Being a greeting card writer might be fun for awhile, but I think it would be difficult to stay fresh year in, year out, unless you could switch “genres” – if that term doesn’t exist in the greeting card industry, I think it should: Birthday & anniversary genre; condolence genre; or flippant, schmaltz, generic, and even hate-mail genres. Can you think of others? Gold Reclaimer: Scour old teeth for fillings, melting the gold from them with broken gold jewellery into tiny gold pellets, which is then re-sold to jewellers. Google cyclist: Gathers images for Google Earth’s street views in traffic-congested cities. Gross Stunt Testers: The film and television industry employs gross stunt testers. These people make $800 per day to test disgusting items such as bugs and fluids to make sure it is safe for others to consume on camera. Gum Buster: Through special steaming tools, they remove the gum stuck to sidewalks, street benches, cinemas and restaurants.